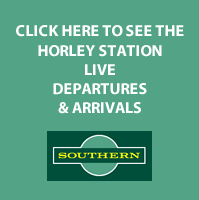 Buses, Trains, Taxis in the Horley & Gatwick area. Fastway - serves Crawley, Horley and Gatwick - website. Buses4U - Demand responsive bus service. - website. As well as serving Horley, Gatwick Airport, Crawley, Redhill and the surrounding area, Metrobus also serve our local hospitals. Hospitals that Metrobus serves - website. Horley Station - live departure board. Southern Trains - buy tickets. Horley Station is on the Brighton Main Line 26 miles south of London Victoria. Train services are provided by Southern. Accessibility - Lifts are available to all platforms on Horley Station. Delay Repay - Information and passenger claim form. 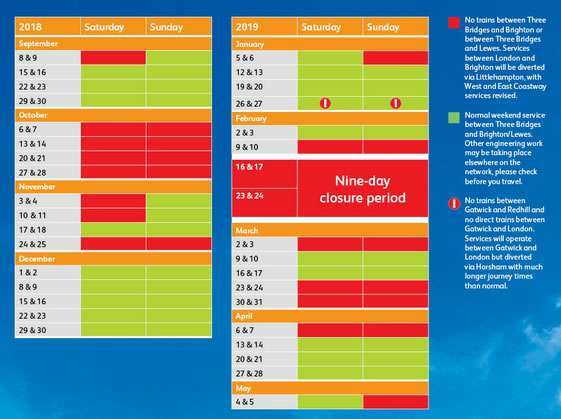 From September 2018 to May 2019 there will closure on the Brighton Line between Three Bridges and Brighton. Below is the current chart (Oct 2018). We will aim to keep this as up to date as possible. Road Runners - 01293 222222 - website. Horley and the surrounding area has excellent local transport. 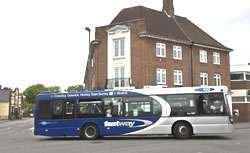 The Fastway bus runs frequently between Crawley, Gatwick Airport, Redhill and Horley. Horley Station has trains to London and the south coast - and there are some good local taxi firms. If you spot any broken links on this page please report them on our contact page.